Ham, Genoa Salami, Pepperoni, Sopressa, Lettuce, Tomato, Onion, Smoked Provolone, Banana Peppers, mayo & our house made Sweet Italian Vinaigrette on Ciabatta Hoagie. It's quite the classic Italian sandwich! sage-rosemary cannellini bean spread, shredded romaine, red onion, tomato, and our sweet Italian vinaigrette. Served in a sundried tomato tortilla. 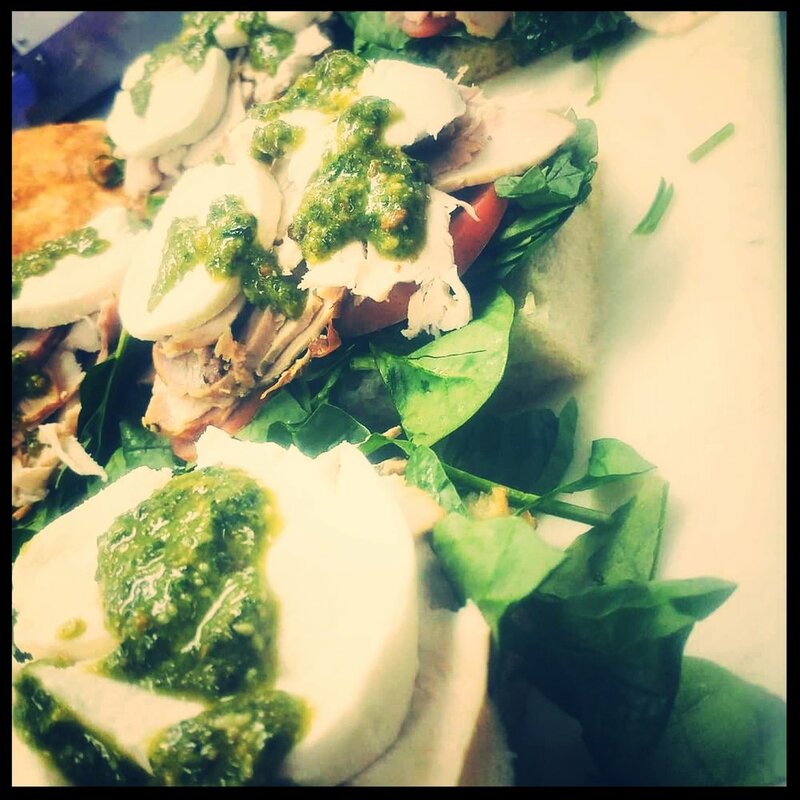 Oven roasted turkey, roma tomatoes, fresh spinach, fresh mozzarella, mayonnaise, and our homemade basil-pistachio pesto. Served on focaccia. Capicola ham, genoa salami, black forest ham, shredded romaine, roma tomatoes, provolone, spicy peppers & fennel, and garlic mayo. Served on a french baguette. Thin sliced prosciutto, black forest ham, fresh mozzarella, shredded romaine, garlic mayo, and a peppadew & artichoke relish. Served on a ciabatta hoagie. Baldarotta's take on a new orleans classic. Capicola ham, genoa salami, and black forest ham, layered between fresh mozzarella and provolone, topped with our olive relish and mayonnaise and served on focaccia. Grilled eggplant, fresh basil leaves, roma tomatoes, thick sliced fresh mozzarella, and balsamic vinaigrette stacked on a french baguette. Crisp romaine, shaved parmesan, and croutons, served with a light caesar dressing. Crisp romaine, shaved parmesan, and croutons, served with a light caesar dressing topped with grilled chicken. Housemade potato chips tossed in a spice blend of garlic & rosemary, SPRINKLED WITH PARMESAN. Crisp romaine, shaved parmesan, & croutons, served with a light housemade caesar dressing. Pasta salad made w/ seasonal produce to cater the needs of your special event! -All sides in the order must be the same. -Limit 4 sandwich/salad types per order. Canned Coca-Cola Products $1.00 ea. Assorted San Pellegrino $2.25 ea.